Ocean Place Estates is an exclusive luxury home community located along the pristine sand of the Atlantic Ocean in Highland Beach, Florida. These 11 private Mediterranean and Old World style estates have a prime location directly on the water. Behind an entrance gate manned 24 hours a day, each home in this intimate community was built with exquisite detail and luxurious features. Some of these features include glamorous swimming pools, updated granite countertops, gourmet kitchens, oversized master suites, large open floor plans, marble floors, home gyms, grand entertainment areas, balconies, and so much more. Outstanding views of the water can be seen from every room in an Ocean Place Estates home, making these estates highly sought after. As well as being able to see the water, each home in Ocean Place Estates has its own individual beach access for residents to lounge by the water and soak in the sun with privacy. Ocean Place Estates are the ultimate in waterfront living. Residents of Ocean Place Estates will always have plenty of activities to enjoy. Living Oceanside allows residents to enjoy various watersports such as swimming, diving, boating, kayaking, tubing, wake-boarding, surfing, fishing, paddle-boarding, just to name a few. 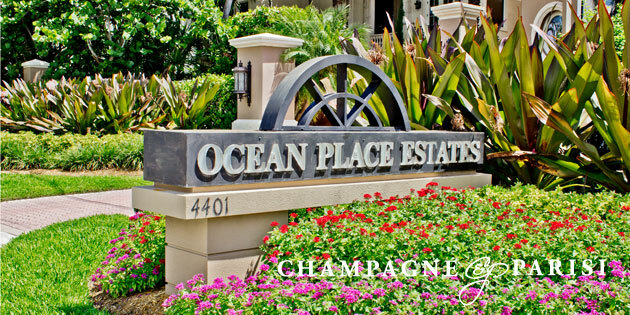 Outside of the community, Ocean Place Estates is located between two of South Florida’s major cities. Residents can strut down the famed Downtown Delray Beach Atlantic Ave, enjoy Boca’s Mizner Park, and enjoy many other boutique style shops and fine dining establishments in between.